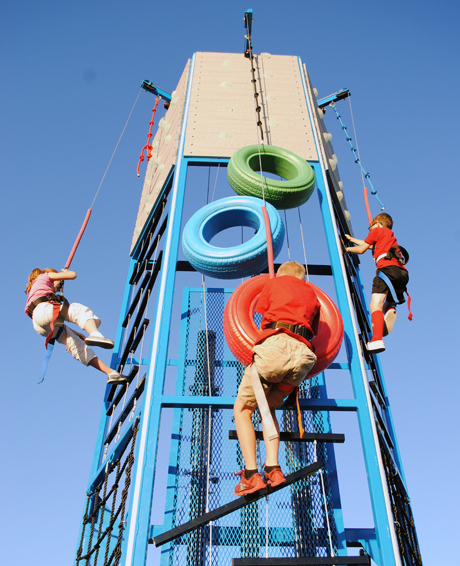 The Climb-N-Challenge is a challenge course / rope course that is vertical instead of horizontal. The upper fame is designed to accept several different interchangeable elements that are challenging yet achievable. The standard configuration utilizes three different elements, starting from the bottom going upwards: “Tremor Ladder”, “Tire Climb” and finally the “THE WALL”. Theme: The standard build has an Adventure camp feel. The trailer and the steel tower are powder coated Tan. We are highlighting each climbing route with different colors of ropes and handholds. This will make it easier for the operator to tell the participants what route may be best for them to try. Custom colors and themes are possible. THE WALL: Just like all the military training centers we are placing a flat wall (this flat wall is made out of a recycled wood material called “TREX”). Weather and wear resistant, handholds will be installed into the TREX with T-nuts) on the top 8′ sections with small handholds to help you get some traction as you use the thick knotted climbing rope to pull yourself upwards to the top. This is a great element, and will draw tons of attention during events. What makes this product so AWESOME? It is based on our climbing walls that are tried and tested for years. We use our Auto-Belay safety system, so the climbers are completely secured and safe at all times. Quality: We are upholding all of our QC standards, ASTM and building to our Engineer’s specs. This new product will come into the market with the advantage that it is a well-built product coming from a well-established company known for our innovation, quality and service. Service: This product will require that the cables on the AB be replaced annually, along with a few other wear items that are listed in the owner’s manual. Always follow the inspection checklist in the owner’s manuals.